I love trying Indian recipes using American ingredients. Zucchini Kootu, Zucchini Pappu, Grits Adai, Grits Idli were few successful ones. To this list I can now add bulgur upma too. 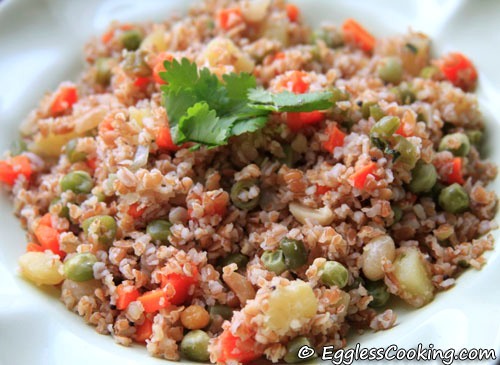 Many people confuse bulgur with cracked wheat. The terms are used interchangeably in many places, but they both are not the same. Broken wheat and cracked wheat are the same but not bulgur and cracked wheat. 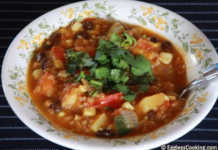 I’ve discussed it in detail in the vegetarian chili recipe. Check it out. I had some bulgur lying in the freezer and wanted to finish it. Tabouli is “the” recipe when it comes to bulgur. I was not in the mood for a salad and also I wanted to use the bits and pieces of vegetables lying in the fridge before refilling it. So I decided to make an Indianized version of tabouli, which is nothing but upma. Just like making cracked wheat upma, I thought I would prepare bulgur upma. Let me tell you this is so much easier and tastier than cracked wheat upma. We liked the chewy texture of bulgur and it was filling too. I also see that bulgur has more fiber than brown rice. Another bonus, bulgur can feed a crowd. Also it tastes even better the day after it is cooked. It soaks up the flavor of the vegetables and tastes very good. Prepare this Indianized version of tabouli using bulgur, which is simple and tasty. In a bowl add the bulgur wheat, boiling water and little salt. Stir it thoroughly and leave it until all the water is absorbed. It may take about 45 minutes. Meanwhile in a big frying pan add the oil and heat it. Once it is hot enough add the mustard seeds. After it splutters add the peanuts (if using) and roast it. Then add the urad daal and channa daal and fry it until golden brown. Add the chopped onions and slit green chili. Add little salt, so that the onion would cook faster. Once the onions are cooked add the other vegetables, 1/2 cup (or more) water as required, salt and close the pan with a lid. Increase the heat and in about 10-15 minutes the vegetables would have cooked enough. To the cooked vegetables mixture add the prepared bulgur and combine it well. Garnish it with cilantro and it’s ready to dig in. If adding peanuts, it’s preferable to add it first after the mustard seeds splutter. Since it takes some time to roast, if it’s added after the urad daal and channa daal, by the time it turns brown the other daals would get burnt. This bulgur upma is good both hot or cold. I had some leftover which I kept it in the fridge. It tasted so good (or even better) the next day, even straight from the fridge. Bulgur before soaking may look very less but after it absorbs the water and especially with so much vegetables it makes huge quantity. You can really feed an army. 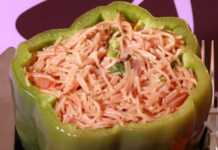 Try it when you are having a potluck or friends over. When I first measured 1 cup of bulgur, I thought it would not be enough for the 2 of us. Usually I use 1 and 3/4th cups of vermicilli or cracked wheat for preparing upma. So I measured another 3/4th cup of bulgur to prepare this upma. Gosh! that was so much for us. So I did not add the entire bulgur to the cooked vegetables. I reserved some for later. Luckily I got another idea to make use of the excess bulgur. That dish turned out very good too. Will post it later. Next I want to cook pulav using bulgur. I’m sure it would taste equally good. This bulgur upma goes to Roma’s JFI-Wheat. JFI originally started by Indira. 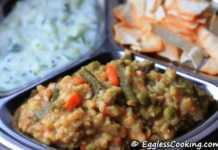 your upma looks lovely ,loaded with veggies.I have tried making veggie pattie with bulgur wheat and it had turned out tasty.will try you upma,my husband is a great lover of upma. Veggi patties with bulgur? That’s interesting. Will check your blog to see if you have posted the recipe. I have made a similar one earlier with bulghur. this one is loaded with veggies. Will try this sometime. where to buy this bulgar wheat? i hav a salad recipe with that i got from my chid’s school teacher. I got it in the organic section of the regular grocery store (Giant). You can try it in any other health food stores like Whole Foods or Trader Joes. Madhu..no words to say how happy i am…i received ur gift today morning through post…oh my god, am surprised n very excited to receive the cookbook for baking Madhu, u r first person who bought a cookbook for me, i never bought any book regarding bakes r cooking yet..i usually google for the simple recipes n try myself by adding n creating new bakes…U made my day..my hearty thanks to u for ur marvellous gift :neutral:…Thanks a lot Madhu..
Thats a healthy dish..i made khichidi with carrot n bulgur long back…http://priyaeasyntastyrecipes.blogspot.com/2008/11/rm2-day-12-carrot-bulgur-khichidi.html..wonderful dish..
Good idea. That looks like a great one pot lunch. Cool! bulgar is like Dahlia right? only quicker to cook. I love it Madhram :)I make this atleast once a week as it’s really filling and healthy too! I too had posted the recipe in my blog sometime back. The pics look superb. Have a great weekend. I see bulgar wheat in the supermarket all the time but never buy it cuz i have no clue what to make with it. this dish is super pretty! I have one more recipe with it Nags. I’m sure you would like that too. Oh I have never tried Bulgur. Mebbe its time! I have made this upma without the vegies though. I would like to add them next time…and I have the same question~ Why in the freezer??? Is it to keep it fresh? To keep it fresh. I usually keep wheat germ, flax seed meal, soy flour and other flours too in the freezer so that they don�t go rancid. Loved this new twist to our classic Upma. BTW, why did you keep Bulgar in the freezer ?? To keep it fresh Anjali. I usually keep wheat germ, flax seed meal, soy flour and other flours too in the freezer so that they don’t go rancid. wow! nice healthy recipe. thanks madhuram. never knew there was somthing called bulgur wheat will try to get this weekend. but is it available in american store? Have a great weekend, I will be off now until Monday, loads of work to do but looking forward to it.